It’s been odd this Easter to not be involved in any Church services for the first time in 6 years. I must say I’ve missed it, especially the amazing atmosphere that used to be a regular feature of services at St Bartholomew the Great. There are, however, some major benefits and the best of all is time with the children over their school holidays. A jaunt down to Devon was much needed and gave us our first opportunity to see Monty in full flight over the beaches of Instow and Westward Ho! Needless to say there was an awful lot of running about and I’m not sure who came back most worn out, Monty, the kids, or Grace and myself! Now for a rest…. or maybe not. On Thursday we are giving a performance of some wonderful music by composer Alexander L’Estrange, all of which we recorded last summer. There are some truly beautiful works here that will be new to everyone. It’s always a great sign when professional singers give a thumbs up to new music in sessions and with this project it was a case of every one being a winner! Classic FM have been playing several tracks this week and there’s been a fantastic response, so we’re hoping for a big crowd at St James, Spanish place in Marylebone; a church with the finest acoustic of any London! Hope to see you there! Wells Cathedral is possibly my favourite in all England and for the first time in its existence Tenebrae will give a concert there in aid of Somerset Community Foundation on April 15th. We’ll be performing one of our most enduringly popular programmes – A Hymn of Heavenly Beauty – featuring such well known works as Allegri’s Miserere (with the famous top Cs for the soprano in the solo quartet), Song for Athene, The Lamb and A Hymn to the Mother of God by John Tavener (with Tenebrae surrounding the audience for a sonic experience like no other!) The concert starts with arguably the most beautiful of all penitential motets by Alonso Lobo, Versa est in luctum, which was the opening track on a recording we made a few years ago that featured Victoria Requiem as the central work. Happily, the disc won the BBC Music Magazine Award for Choral disc of the year in 2012, something which neatly brings me to my final item in this blog, as I am thrilled to say that we have won this most prestigious of awards again, this time for our recording of Brahms and Bruckner motets. 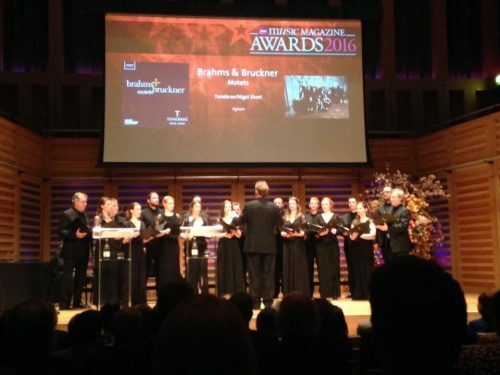 We had a fabulous evening last night at Kings Place and the choir very kindly gave of their time gratis to sing Christus factus est by Bruckner as part of the Award Ceremony. We were delighted to receive the Award from Dame Mary Archer, a great supporter of the choir, and to spend time with so many people who were heavily involved and jointly responsible for the disc’s success; none more so than our fabulous sound engineer, Andrew Mellor, who’s idea it was several years to go to put these motets side by side. It took a long time for the project to come together, but thanks to the generosity of many people the idea eventually became a reality and I cannot tell you how ecstatic I am that the recording has received such recognition and this amazing accolade. Andrew tragically lost his father to cancer a few years ago, and Tenebrae lost its co-founder Barbara Pollock to the same disease in 2010. It was always Andrew’s wish that this disc should, in some way, benefit one of the great Cancer Charities that carry out such terrific work caring for those diagnosed with terminal cancer. I think this sense of dedication and remembrance played its part in giving all the performers an added focus when it came to the recording sessions, and I believe we were acutely aware as we were recording that something very special was taking place. Macmillan Cancer UK will benefit from all sales of the disc and for that reason alone I hope it sells thousands of copies. If you haven’t already then please do go and buy one! I’m very much looking forward to several performances of this stunning repertoire over the next year or so.